Is there a better alternative to NoteShare Server? Is NoteShare Server really the best app in Personal Info Managers category? Will NoteShare Server work good on macOS 10.13.4? Fixed issues related to OS X 10.9 Mavericks. Fixed issue with favorite characters not appearing in Edit menu. Fixed issue with zoom settings causing entry contents to not be visible. Fixed crash on save when closing notebook after adding attachment. Fixed issue with Contacts toolbar button. Fixed issue saving new notebooks on certain systems. NoteShare Server needs a review. Be the first to review this app and get the discussion started! NoteShare Server needs a rating. Be the first to rate this app and get the discussion started! 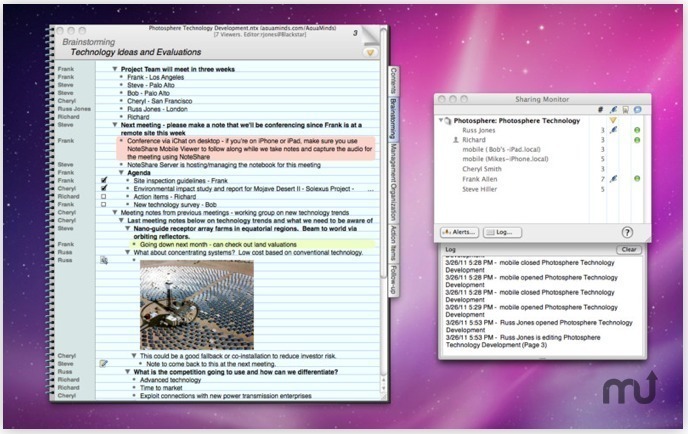 NoteShare Server for OS X provides easy, centralized 24/7 sharing of notebooks for workgroups or medium-sized organizations that use NoteTaker, NoteShare, NoteShare Mobile Viewer, or NoteShare Express. It enables you to dedicate an OS X computer to continuous sharing so that your team's notebooks are always available from anywhere in the world. Remote server administration allows management of notebook spaces, creation and uploading of notebooks, password administration, status monitoring, and more from any location on almost any OS. As an enhanced version of NoteShare, it runs as a regular application and is simple to install and configure. NoteShare Server organizes shared notebooks using public and private Spaces, just like NoteShare. But with NoteShare Server, notebooks are shared from a dedicated computer and remain continually available to viewers, without even having to be open on the desktop. Even after a re-start or re-boot, NoteShare Server is immediately managing and sharing your notebooks. It's that simple. And at the same time, you can also use it like a regular version of NoteShare, to create and work with personal notebooks that aren't shared with anyone, or to share them yourself. Easily administer NoteShare Server locally or remotely from almost any computer, using the companion cross-platform application NoteShare Server Administrator, available as a separate free download from our website. The download also includes optional browser-based versions of Administrator and NoteShare Express.